Answering Questions! 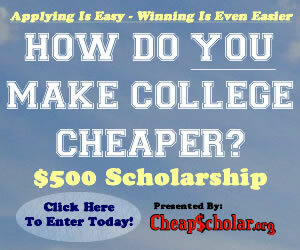 At CheapScholar.org we understand that the financial aid process and paying for college can be a challenging task. We also know that it is very common for families and students to have questions along the way. We are here to help! Keeping It Simple! We are sure that you find this hard to believe, especially given the topics we are certain to encounter, but we will do our best to keep this a JARGON FREE zone. If at anytime we have to use terms or acronyms that can easily be construed as confusing, we will be sure to provide a quick and simple definition. Providing Great Networking! By visiting CheapScholar.org, you will have the ability to share your own successes and challenges that you have experienced along the way on varying topics and with different college campuses. If you would like to be a “Cheap Scholar”… you can do so by visiting our website often, subscribing to our updates via RSS FEED, or you can sign up to have our articles delivered directly to your inbox via email. You can also follow us on Twitter!